The comparison of this Thikana can be done with that of the Raja of Banaras; the only difference is that the Taja of Banaras had a little bigger Kingdom. The Raja of Sahar had about 160 villages. Just like the Raja of Banaras who in the 18th century with the help of the previous Governor of Awadh (Oudh) Rustom Ali was able to accumulate a large chunks of land and his son was granted the title of Raja in the same manner Kuwar Sadan Singh JI Sengar with the help of Governor Almas Ali Khan and accomplice Raja Bara Mal was able to transfer hundreds of villages for the services rendered to the royal court. The King of Banaras was given the title of “His Highness” and declared an independent king (Ruling Prince) but the British government acted in a step motherly manner and gave a title of Raja to him. As a natural result of this terrible famine, “cultivation decreased and tenants emigrated” and “all the remaining parganahs became bankrupt.” “In 1840, the outstanding balances amounted to over 15 lakhs of rupees.” Or over one year revenue. As has been mentioned above “the Government of the time was strong against the talukdars,” and “in spite of the utter impossibility of realising rents from the cultivators, of which the authorities were well aware, the talukdars were pressed for their revenue, and on their inability to pay, their estates were put up to auction.” The result was to quote Mr. Crosthwaite, ‘Bidders there were none, but the Government in the talukdar’s rights for a mere song and gained their objects – the ruin of these large chieftains and dispersion of their influence and property,” thus the large talukdars were ruined almost to a man. 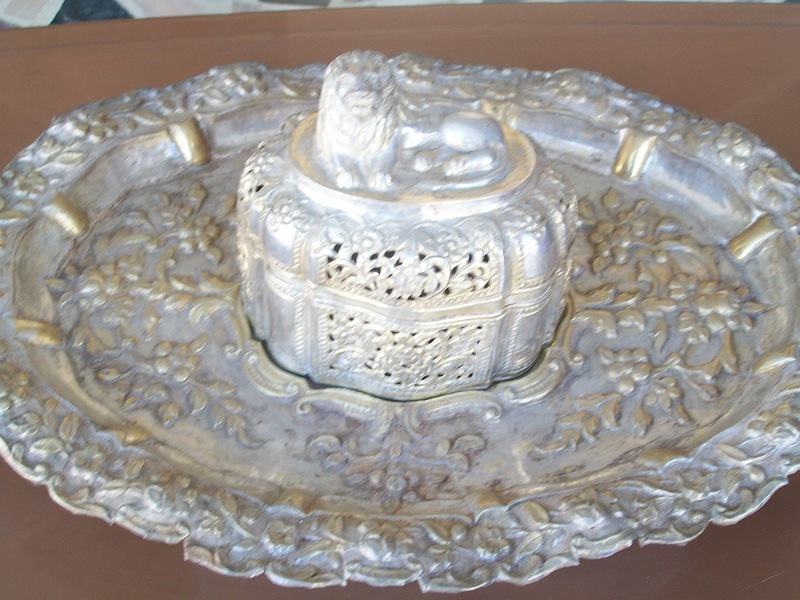 Chandan Singh was succeeded by his sons, Chhatar Singh (the great grandfather of Lal Narain Singh) and Mahipal Singh. 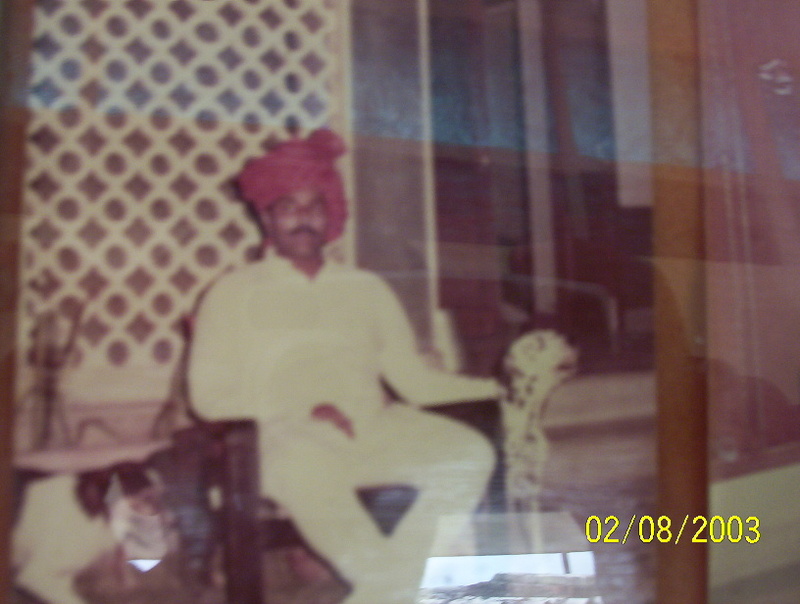 Chhatar Singh was “one of the most respectable gentlemen of the district”. The outbreak of the mutiny in the Etawah district was most sudden and unexpected. Elsewhere, perhaps, the shadow of the calamity may have preceded it and diffused a vague sense of insecurity and alarm; but in Etawah there was nothing but hopefulness and peace. The news of the outbreak of the Mutiny at Meerut reached Etawah through Agra on the 12th May, 1857. But, save few skirmishes with the rebels in the following days, the greater portion of the district remained comparatively calm; however, as danger was imminent, martial law was proclaimed in the district on May 27th. Soon after, there was a serious rebellion in the Cawnpore and other districts, and Mr. Hume, the then Collector of the Etawah district, dispatched “all the best of his police officers with some trusty Zemindars to take possession of the neighbouring parganas of Sikandara, Rasulabad, and Dera- Mangalpur in Cawnpore.” Lal Chhatar Singh of Sahar, was also sent along with them to Cawnpore districts and did excellent work there; meanwhile, “on the 16th of June news arrived of the mutiny and massacre at Gwailor.” And “early on the morning of 17th June, accordingly, the Europeans assembled at Mr. Hume’s house, and after some consultations it was resolved to retire upon Agra,” which they did. At this time, “Rao Jaswant Rao, Kunwar Chhatar Singh, and the remainder of the police that could be trusted were in Cawnpore district. There was therefore, no force in the district upon whom the European could rely.” The city of Etawah was therefore at once plundered by the Grenadiers though, on the town’s people rising against them, they had finally to leave the city and move across the river. In the district there was no disturbance, and as according to Mr. Hume, “there was no latent disloyalty in the people” the entire situation once more in a few days became tranquil. After the lapse of some time, the tranquillity of the situation in the district was again disturbed, and several bands of rebels under powerful leader rose up, and from October 1857 the district was once more involved in fighting them out. This continued till December when a large body of rebels from Farrukhabad invaded the district, and “anarchy once more took the place of order. 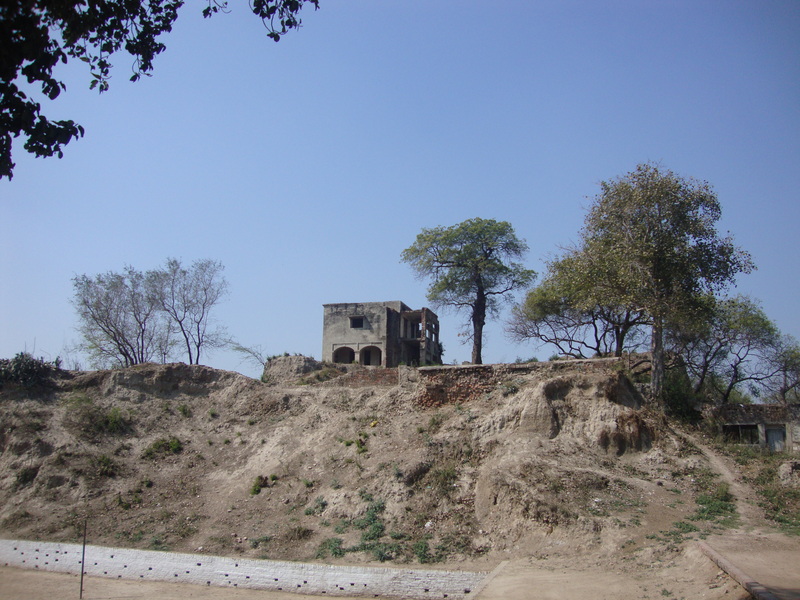 In Bela, the tahsildar found himself unable to move out of Chhatar Singh’s fort at Sahar.” Their triumph was cut short by the arrival of Brigadier Walpole’s column on the 25th of December, Which advanced through the rebellious areas and every where the mutineers melted away before the British force. Early in January 1858, district once more became tranquil, except in Auraiya. In spite of a few risings here and there, the bulk of the district enjoyed comparative calmness during February and March. In April, an expedition was sent against the rebels in Auraiya which after some time succeeded in its object of putting down the rebellion in that portion of the district. 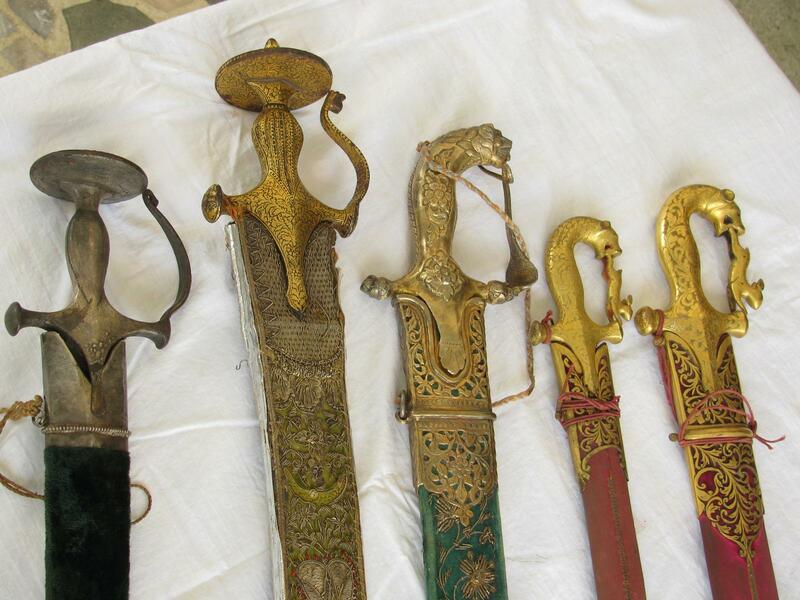 About the end of April, the Rasulabad Tahsil in the Cawnpore district was again attacked by a large body of rebels. Lal Chhatar Singh of Sahar accompanied by some Zemindars of Cawnpore was engaged in defending the tahsil against the enemy, and they acted with such courage and firmness that their success was complete on the 25th April 1858, and the enemy having failed totally were put to flight. In May, the rebels in Auraiya again rose but the British forces, sent against them, having succeeded, after some action, in putting them down completely, the tranquillity of the district was once again restored, and the force returned to Etawah on June 2nd, 1858. Chhatar Singh was also appointed by the Government as an Honorary Magistrate, he always used to take “a great interest in his work” as an Honorary Magistrate, and rendered valuable assistance to the authorities in that capacity, as evidenced by their opinions about his work in several letters and testimonials. Chhatar Singh was succeeded by his son, Tej Singh, and Tej Singh was succeeded by his son Drigbijai Singh. He continued to manage the estate left by his father Tej Singh. In the meantime, the Malhausi estate, belonging to his uncle, Lokpal singh, which was in the possession of the latter’s widow, Rani Jas Kunwar, also fell by the right of inheritance into the hands of Drigbijai Singh, when the Rani died. This again served to add a good deal to the estate which was one of the largest and most important of talukas in the Etawah district. He at last succumbed to one of these attacks of his ill health to which he was so often subject during the later days of his advanced life, and breathed his last on the 15th of January 1921, and was succeeded by his son and heir, Lal Narain Singh. Lal Narain Singh enjoyed the esteem and respect of the authorities who had always a high opinion of his services and character. 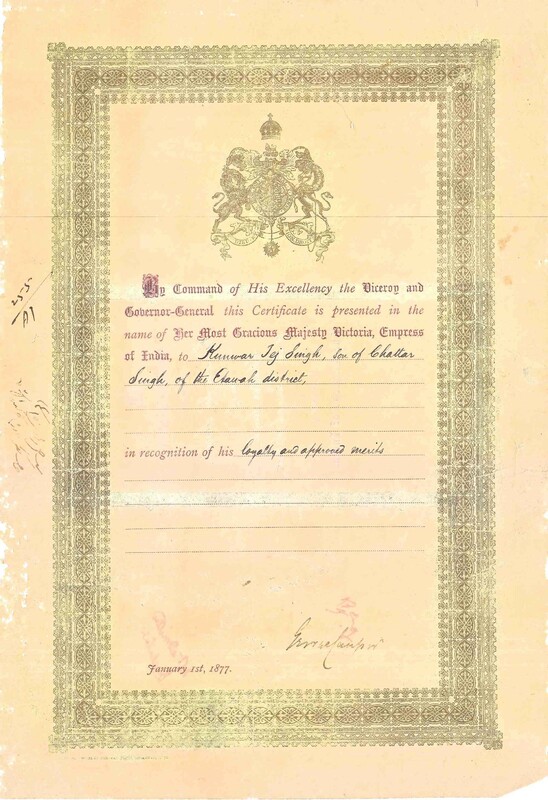 In recognition of his loyalty and approved merits, he had the honour of being presented with a certificate of loyalty by the Command of His Excellency the Governor-General in the name of Her most Gracious Majesty, Empress of India, on January 1st 1877.He established the oldest Junior College in Etawah District. 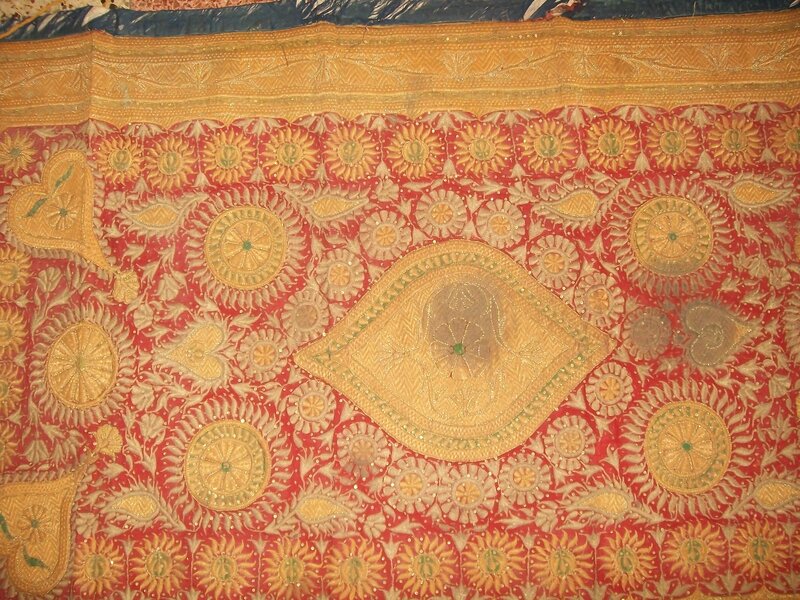 The last Zamindar and head of the Sengar clan was Raja Lokendra Sah, O.B.E. of Jagammanpur, in the Jalaun district, and it is certain that the headquarters of the clan had been established for centuries at Jagammanpur. This family was connected with the Sengars of the Etawah district. The Raja owned “46 Jagir villages with a rental of Rs 72,751.10. On which he payed a perpetual quit rent of Rs 4,764/- and thirteen Zamindari whole villages and shares in five others, paying revenue of Rs 11,115/-.” The title of Raja is hereditary and dates from 1100 A.D.; it was recognized by the Peshwa in 1717, and has always been acknowledged by the British Government. The Raja exercised the powers of an Honorary Magistrate within the limits of his estate. Another representative of the clan was Raja Makund Singh of Hardoi, in the district of Jalaun. The title of this Raja was also hereditary, and had been retained by the head of the family since 1095 A.D. and was also recognized by the British Government. The other connected Sengar families of importance in the district of Etawah itself, among whom may be mentioned Rao Chat Singh of Bikra, Rao Jodha Singh of Kakaotu, both of whom are hereditary title holders from very ancient times, and their titles have all along been acknowledged by the Mugal Emperor and subsequently by the British Government, as such. 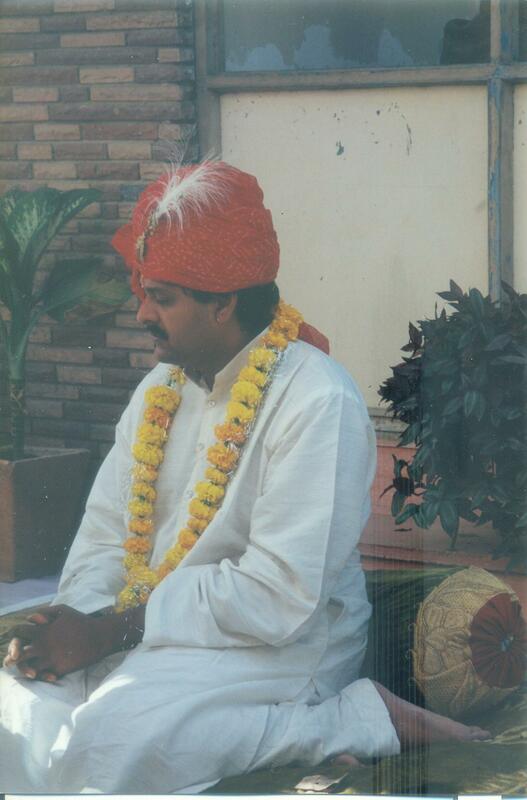 Raja Raghubir Singh was an Honorary Magistrate of Ruru in the Etawah District also belongs to the Sengar clan. The title of Raja had been held by the house for several centuries, and had been admitted as prescriptive by the British Government. Another very important Sengar family in the district of Etawah was that of Bhareh. The head of the family, Raja Niranjan Singhowned 32 whole villages and three mahals, paying revenue of Rs. 29,193/- in Etawah. The title of Raja had been borne by the chieftains of the family since very ancient times, and had been admitted by the British Government since the cession of the district in 1801. Besides the Sengar families given above, there were few representative of this clan in other portions of the United Provinces of Agra and Oudh, who held land to a considerable extent. Among these may be mentioned Thakur Balbhadar Singh of Kanta in Unao district. He owned 9 villages and 2 pattis in the district and payed a revenue of Rs 11,862/- . He was a talukdar of Oudh, and was also a Government Darbari. The Honorable Raja Kushalpal Singh of Kotla, who was the head of the Jadaun Rajputs of the province of Agra, stood in relation as an uncle to Lal Narain Singh. The Raja owned of a considerable estate in the United Province, comprising 61 mahals paying Rs. 53,311 as land revenue in the district of Agra, 16 mahals paying Rs. 20,052 as land revenue in the Mainpuri district, and 4 mahals paying Rs. 6,972 in the Etah district. 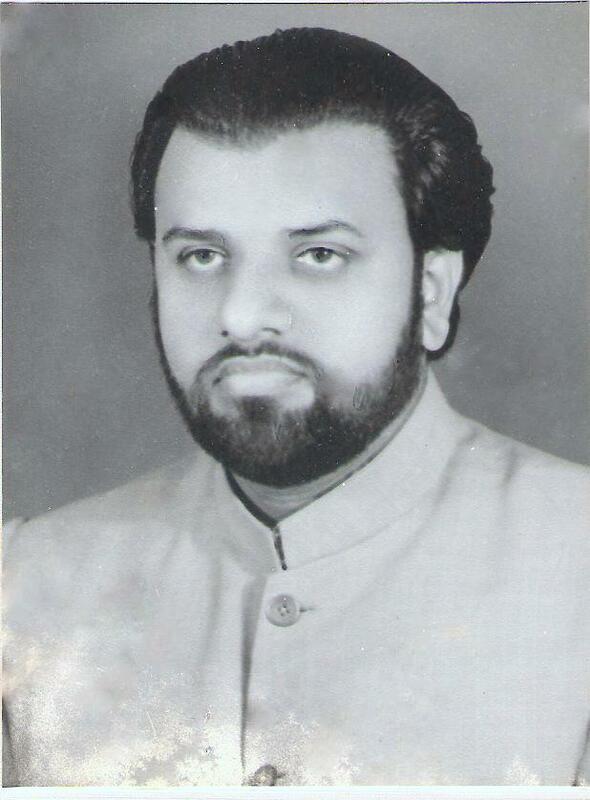 Raja Kushalpal Singh, was a member of the Legislative Assembly and had long been a member of both the Imperial and Provincial Legislative Councils. He was also an Honorary Magistrate. Raja Jagmohan Singh of Lahar, district Bhind, who was the head of the Kachhwaha clan of Rajputs in the Gwalior State, and Kunwar Balbhaddar Singh of Waziroura, in the Agra district, belonging to the Jadon clan of Rajputs, were both related as uncles to Lal Narain Singh. They held considerable landed property, and the latter was also a Civil Surgeon in the United Provinces. Thakur Hulas Singh Rais and the head of the Gaur of Makrandpur Kanjiri, in the Cawnpore district, stood in relation as maternal uncle to Lal Narain Singh. He also held a considerable estate in the Cawnpore district, and payed annual revenue of Ra 7,630/- to the British Government. Kunwar Kulbhan Chandraji of Raghunathpur, in Sheopur district of Gwalior State, who was a member of the family of the Ruling Chiefs of Karauli, was a brother-in-law to Lal Narayan Singh. The family held considerable landed property in the Gwalior and Karauli States. Rao Padam Singh of Malgaon in the Cawnpore district, belonging to the Gaur clan of Rajputs and Diwan Chet Singh of Parna in the Agra district, belonging to the Bhadauria clan of Rajputs, both of whom held hereditary titles from the British Government, were also related to Lal Narain Singh. 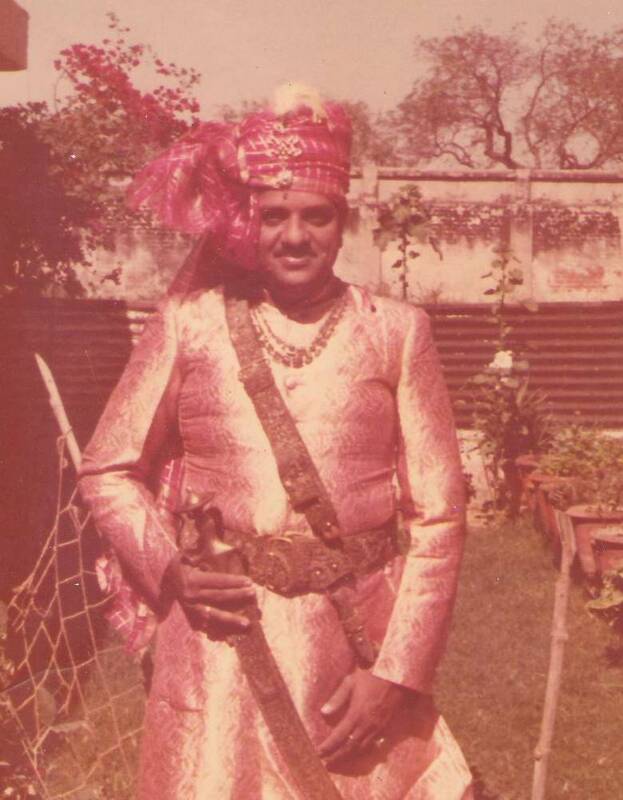 Raja Hukm Tej Partap Singh of Pratabner, holds considerable estate in the Etawah and Mainpuri districts, was also related to Lal Narain Singh. The title of Raja is of very great antiquity, and has been acknowledged as hereditary by the British Government. 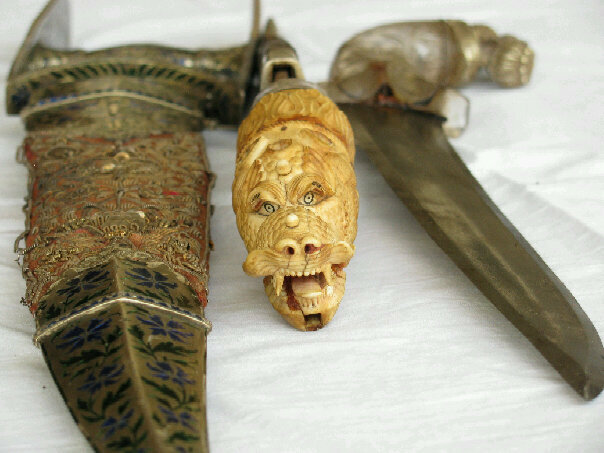 The Raja is the head of the great Chauhan Clan of Rajputs. 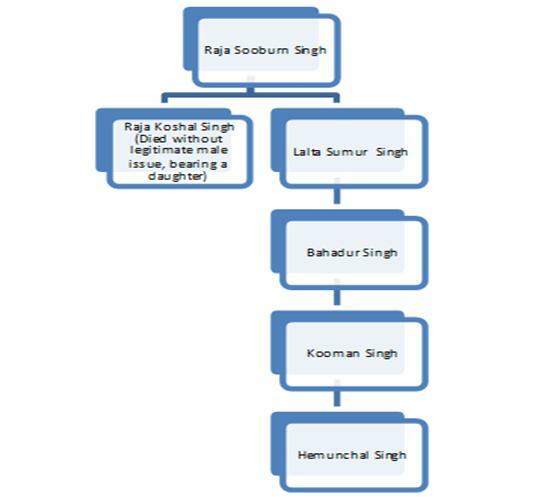 Thakur Tara Singh, Rais and Zemindar of Bhartua, in the Aligarh district, belonging to the Solanki clan of Rajputs, were also very nearly related to Lal Narain Singh. The British Government appointed him as an Honorary Magistrate. There were various other important families holding considerable estates in the United Provinces and elsewhere to which Lal Narain Singh’s family was related. Amongst these may be mentioned the Gaur Rajputs of Khanpur Dilwal in Cawnpore district, the taluqdar of Gopal Khera in the Lucknow district, the Raja of Baroda in the Sheopur district of Gwalior State, the Chauhan Zamindars of Ibrahimpur in the Hardoi district, the Janwar Thakurs of Fatehpur Chaurasi in the Unao district and the Bais Zemindars of Kare Bojh in the Etawah district, all of whom are connected with the family of Lal Narain Singh by important relationships. Lal Narain Singh was succeeded by his son Lal Harvansh Singh alias Lal Bhuwneshweri Prashad Singh. He was born on 1st October 1938. By 1947 the British had left the country and India had become independent. Being a visionary he upgraded the Junior College first to High School and then Inter College having science. He not only persuaded agricultural business but also established one of the largest poultry operation in Northern India during the 1964 to 1970. He was a member of the Animal Husbandry Board and also an advisor to Rani Shever and military farms. He was invited by Doordarshan (All India TV) talk shows, Krishi Darshan programs and All India Radio. He worked in developing the local strain of layer birds to improve the production and the breed that he created were among the top three highest egg producing bird in the country during the Random sample test held at Hasarghatta, Bangalore in the year 1971 to 1973. He worked as the Director for Health and Agriculture project at Rabbani School, Gwalior and reclaimed Usar land (waste land) with sulphuric acid overnight. More than 50 acres of land which was usar was reclaimed and plantations were done. The school received the “Indira Maitrey Award” for the achievements. He published a book “Saral Kheti” which has been given great reviews. The ones to be mentioned are by Dr. V.P. Shukla, Coordinator Extension Services, Jawahar Nehru Krishi University (M.P. ), K. Das Rahi, Professor and Head of the Department, Chandera Shekhar Agriculture University. He founded an NGO “Lokarpan” in the year 1996 to work for the development of the rural community. He believed that if opportunities are made available in the village the people will not migrate to the cities. He believed in the empowerment of women and hence worked for the upliftment of women. With the effort of Lokarpan emphasis was given to “Education of Girl Child” and “Safe Motherhood and Child Survival”. For his work in the field of Health, the Planning Commission in their report of Uttar Pradesh in their Medical and Public Health report, (Chapter XI) in 2002 mentions about his NGOs work . “ Civil Society Intervention in the Health Sector of U.P. 12. In Uttar Pradesh NGOs seem to be playing a very significant role in the Health Sector of the State. Across the state in almost all the economic regions of the state NGOs have made some significant intervention. Some of the important NGOs which are active in the health sector are The Hunger Project, Lokarpan, Sakhi, Manav Seva Sansthan etc. It needs to be mentioned that NGO movement received a significant boost after the formation of SIFPSA (State Innovations in Family Planning Services Project Agency). Other important agencies which are making a significant contribution in terms of institutional financial support are CRS North India, CARE and Prema etc. Around 81% of the mothers have been provided Anti Natal Care (ANC) coverage . In the NGOs non-intervention area the coverage was only 54%. 89% of the children were vaccinated. However, in the non-intervention area only 65.5% are vaccinated. Lal Harvansh Singh was married to Shanta Singh, in Kulharia, Aara District of Bihar. His wife’s relatives are in Thikana Paho and Khajurgaon in District Rae Barelli, Thikana Shahmau, District Sultanpur, Thikana Baroowa, District Gaya in Bihar, Royal family of Rathu, District Ranchi, Jharkhand. He was blessed with three daughters and two sons. 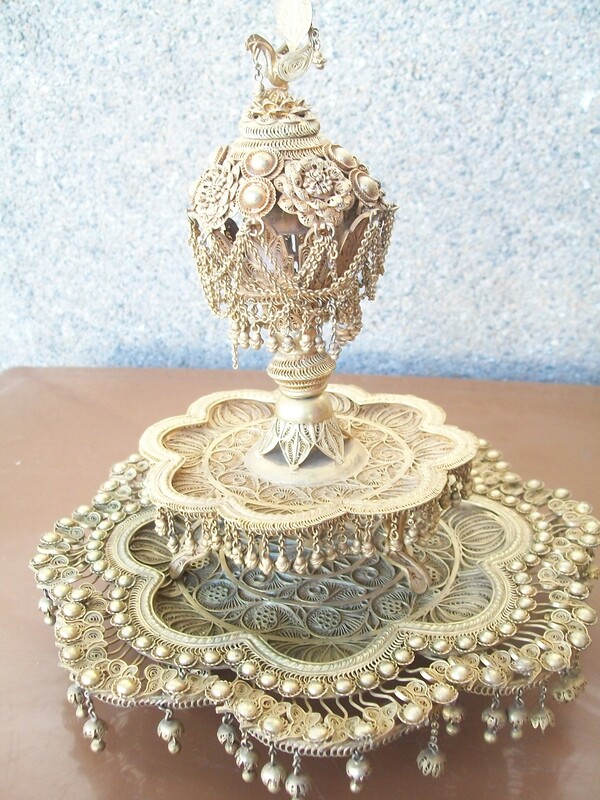 His eldest daughter Seema Singh married Ajay Pratap Singh, of Galgalah, District Unnao in Uttar Pradesh. She is blessed with a son Rakshit P. Singh and daughter Richa Singh. His son Rohit Sengar married Ujjwala Gaur and is blessed with a son Dhruv Sengar and daughter Ishita Singh. His youngest daughter Sabina Singh married Derek Smithwick and is blessed with a son Rohan Varqa Smithwick and daughter Dia Smithwick. His sister Jaswant Kumari was married to Col. Sumer Singhji of Thikhana Chittora, District Tonk, Rajasthan. She was blessed with a son Col. Naval Singh Rajawat. His mother was from Thikana Baler, District Swaimadhopur, Rajasthan. His mothers relatives are in Thikana Gondishanker and Borkhedha in Madhya Pradesh, Thikana Kacchnavda, district Kota in Rajasthan, Thikana. Bharey in Uttar Pradesh and Nepalganj were his relatives. Lal Harvansh Singh passed away on November 6th, 1999 and was succeeded by Rohit Sengar who converted the Layer operation into Broiler Operation run under a private limited company M/s Sengar’s Agro Farm Pvt. Ltd. The family has been able to establish its operation at Malhausi and Kanpur. He has established a Rice Mill with a 1.5 ton/hour capacity and has been able to establish online business under Sengar’s Business Prodigies Pvt. Ltd. the comapy has entered into internet e-commerce website www.freewayeshop.com, bidding website www.freewaybidding.com and mobile and DTH recharge website www.freewayrecharge.com. As the district of Etawah was under the Government of Oudh from 1774 to 1801, so during the time of Sadan Singh the administration of the district was in the hands of Almas Ali Khan. 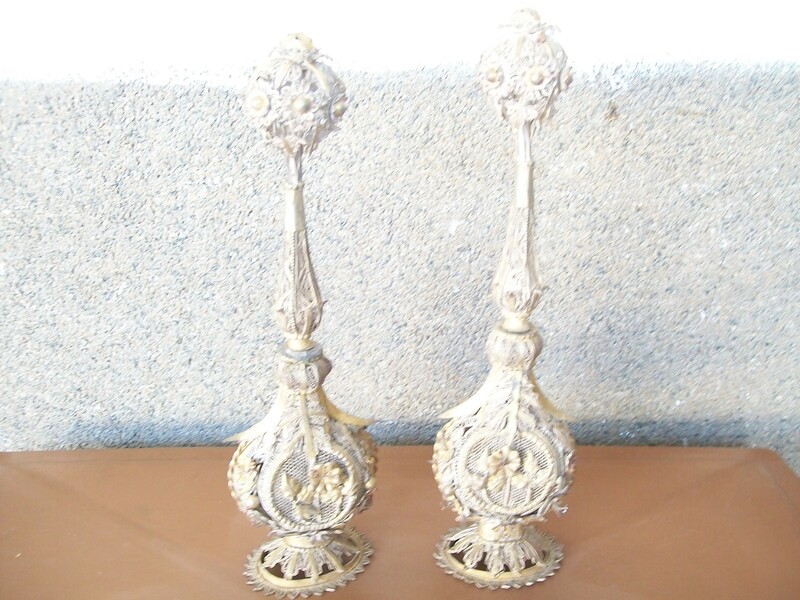 Vide Gazetteer N.W.P. Vol. IV, Agra Division, Part I, Page, 300, 1876 Edition. Vide U.P. Gazetteer, Vol. XI, Page, 96, 1911 Edition. Vide N.W.P. Gazetteer Vol. IV, Part I, Page, 301, 1876 Edition. Vide U.P. Gazetteer, Vol. XI, Page, 99, 1911 Edition. Vide U.P. Gazetteer, Vol. XI, Page, 98, 1911 Edition. Vide N.W.P. Gazetteer Vol. IV, Part I, Page, 266, 1876 Edition. (also see U.P. Gazetteer, Vol. XI, Page, 44, 1911 Edition). Vide N.W.P. Gazetteer Vol. IV, Part I, Page, 327, 1876 Edition. Vide U.P. Gazetteer, Vol. XI, Page, 101, 1911 Edition. Vide U.P. Gazetteer, Vol. XI, Page, 152, 1911 Edition. Vide U.P. Gazetteer, Vol. XI, Page, 153, 1911 Edition. Vide U.P. Gazetteer, Vol. XI, Page, 154, 1911 Edition. Vide U.P. Gazetteer, Vol. XI, Page, 155, 1911 Edition. Vide U.P. Gazetteer, Vol. XI, Page, 157, 1911 Edition. Vide U.P. Gazetteer, Vol. XI, Page, 65, 1911 Edition. Vide U.P. Gazetteer, Vol. XI, Page, 171, 1911 Edition. Vide N.W.P. Gazetteer, Vol. IV, Part I, Page 301, 1876 Edition. Vide Manual of Titles, Page, 101, 1917 Edition, and U.P. Gazetteer Vol. XXV. Page, 73, 1909 Edition. Vide Manual of Titles, Page, 107, 1917 Edition. Vide Manual of Titles, Page, 73, 1917 Edition. Vide Manual of Titles, Page, 71, 1917 Edition. Vide Manual of Titles, Page, 66, 1917 Edition. Vide List of Taluqdars, No. 14, Page,6, 1903 Edition. Vide Manual of Titles U,P, Page, 30, 1917 Edition. Vide Manual of Titles, Page, 78, 1917 Edition. Vide Manual of Titles, Page, 33, 1917 Edition. Vide Manual of Titles, Page, 61, 1917 Edition. The royal family of Rooroo (Ruru) controlled the region of Phaphund. The King Phuphan Dev established Phaphund and till around 1748 B.C this region remained under the control of Ruru and they were also known as Raja of Phaphund. During the battle at Badayun, Raja Shrikushal Singh Ju Deo was injured in 1748 B.C. and documental proof of Rooroo’s control on the region of Phaphund can be read in the Hindi poems compilation of famous poet Dev Ji in his compilation “Kushal Vilas”. This poem was written in praise of Kushal Singh Ji who ruled Phaphund till 1775 B.C. At that time the Moguls started showing their influence in this region and Bagash Nawab Mohammad Khan of Farrukhabad was the governor of Etawah. He started acting as an independent ruler and the Moguls sent Raja Jai Singh of Jaipur to crush him in 1741 B.C. After the return of Jai Singh from Etawah, Bagash Nawab again took control of Etawah till 1748 B.C. Thereafter till 1750 B.C. the Nawab of Awadh and Nawab of Farrukhabad fought among themselves for this region. In 1751 the Nawab of Awadh with the permission of the Mogul emperor took help from the Maratha’s and the King of Bharatpur, Surajmal Jat and attacked the Bagash Pathans of Farrukhabad. There was a treaty signed between Awadh Nawab and Nawab of Farrukhabad in 1742 B.C. Ahmed Khan the Nawab of Farrukhabad paid the Maratha’s compensation between 30 to 80 lakhs rupees. The Maratha’s took over 16 Pargana’s of Farrukhabad in which Etawah was also include and till 1761 the Maratha’s of Jalaun Subedar Govind Rao Pundit had control in the region. In 1761 the Marathas were defeated in the battle of Panapit by Ahmad Shah Durani and Durani gave this region to Hafiz Rehmat Khan’s son Inayat Khan. In 1766 B.C. Malhar Rao attacked Phaphund but due to the defense laid down by the Rohelas he was forced to cross the Yamuna but by 1771 B.C. the Marathas again took control of Etawah region. In 1774 B.C. the minister of Nawab Awadh, Saja’ud Daula again took control of this region. The incidences happened during the period of Raja Kushal Singh Ju Deo. The kingdom suffered heavily due to these fights. He had taken side with the Nawab of Farrukhabad and hence suffered during the reign of the Marathas and Awadh. Govind Rao Pundits once attacked Rooroo. The Maharaja Jagammanpur who was under the Pesewa also came with his army to Rooroo. In the night he meets the Ruru ruler and advised him to leave the fort his family. He took his advice and shifted to the fort at Rueyah. The Marathas destroyed his fort at Rooroo with cannons. At that time Rooroo kingdom was spread towards the southern side of Rooroo till Auraiya which was 11 Kose from Rooroo. In the northern side of his empire spread across Gandakh till Rueyah. The eastern region of his empire spread till Kainjari in Kanpur District. The western region spread till Gopiyaganj which was 11 Kose from Rooroo. The held the title of Rahise Azam. The kingdom was plundered by the Ruhelas and the Marathas. In 1774 the region came under the control of Awadh and peace came to this region for some time. In 1775 maharaja Kushal Singh Ji died without any issue. As per the prevailing custom a successor was adopted from the brothers or uncle of the king’s family. The younger brother Shri Lal Samar Singh Ji great grandson Lal Hemunchul Singh was adopted by the Rani Shrichandershivan Ju Devi and the second queen Rani Shribhadaurin Ju. The succession was recognized by the tribe. At the age of five the land management was transferred in his name. In the Alamdari of the Nawab this region was controlled by the Raja Bhagmal of Bithur under the Nadirshahi. During this time Sadan Singh Sengar (Sahar) and his son Chandan Singh took in position a large portion of this empire and what was left was taken by the Nawab. Due to this reason there was great enormity between the two families. In the mean time Sadan Singh was able to build his empire which spread to 160 villages which were acquired from Ruru and other nearby rulers. Chandan Singh tried many a time to uproot the ruler of but did not succeed. In 1801 B.C. the British took charge of the region and the Raja Lal Hemunchul Singh has been for about 20 to 22 years on the throne. The British changed the land revenue management after one year of their succession. The King had only 34 Villages with revenue of Rs 15668 per year under his position and the rest were taken by Sadan Singh of Sahar. In the next land settlement Rani Shribhadaurin Ju got 37 villages with revenue of Rs 53111. Raja Hemunchul Singh filed a case against The Rani and Chandan Singh in the Regional Court on 22nd Dec 1810. Chandan Singh got himself pardoned saying that he is just a under tenant. The Regional court ruled against the King and rejected the claim of the Raja being adopted. The Rani died in 1815 and the British on 26th September 1816 again gave Raja Hemunchul Singh the right to the lands. This was challenged by Raja Kushal Singh Ju Deo’s illegitimate son Kuwar Gunsham Singh and Kuwar Ratan Singh who was Rani Shrichandershivan Ju Devi daughter’s son. The Regional Court ruled in favor of Kuwar Gunsham on 14th July 1817. The ownership was transferred to Gunsham Singh of Khavaswal as per the judgment of the court in 1837. All further efforts made by the Raja were rejected by subsequent courts. ” 6th. 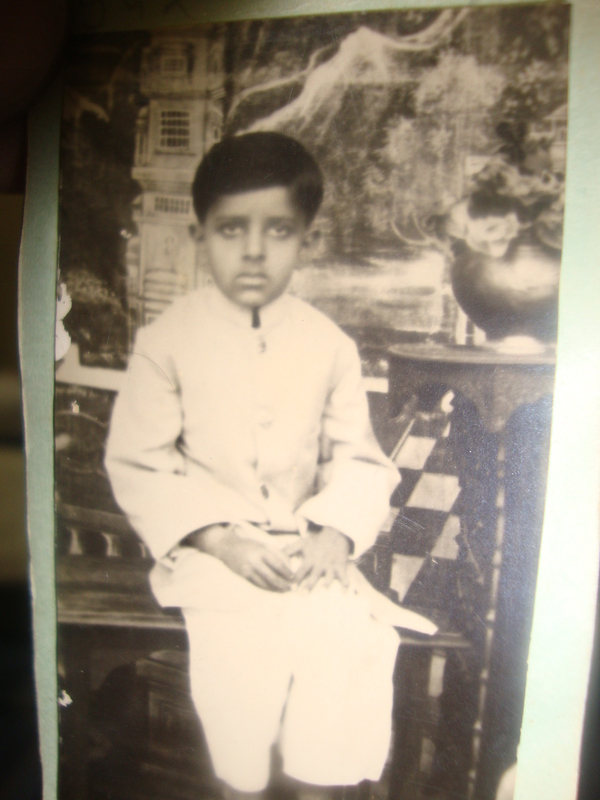 Hemunchul Singh, great grandson of Sumur Singh, the brother of Raja Khosal Singh vide marginal note, is universally regarded by the Sengar’s as the rightful heir of the Raj, and is familiarly styled among them”The Rajah.” His adoption by the Ranees Chunder Bunsin and Bhadaurin after death of Raja Khoshul Singh is affirmed by all. Further, it is stated that he was in possession of the Raj at the time of the cession”. In 1840 land management of Etawah District again took place and Master M.R. Gabbins, Officer In charge of the arrangement of Land Management vide his letter reference no 339 dated 9th December 1840 wrote to the Commissioner of Agra division about the Rooroo Kingdom the gist of the letter are as such. During the time of Gaddar, the District collector of Etawah was not happy with the Rajas role and wanted to file a case against him. In 1858 after the Raja Fateh Singhs death his son Raghunath Singh was considered the title holder. 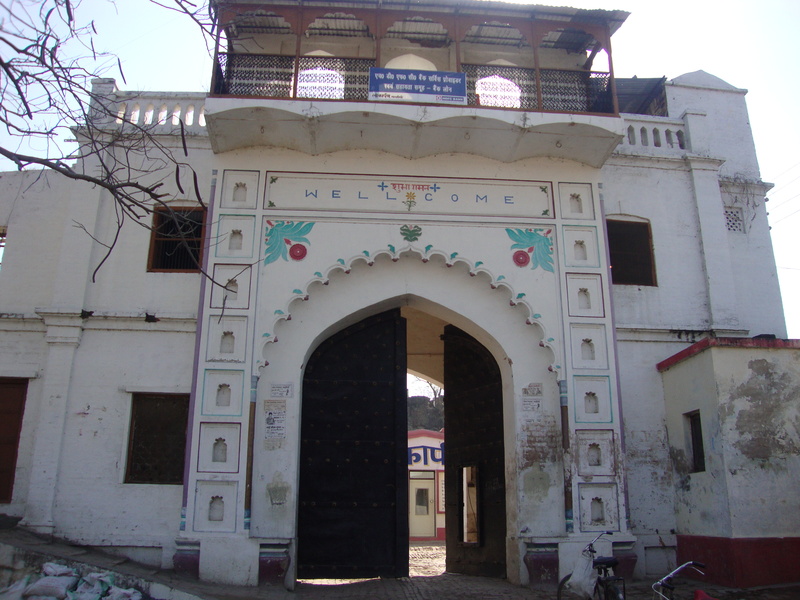 ” Raja Raghubir Singh of Ruru is one of the three leading Darbaris of this district and is one of the three acknowledged heads of the great Sengar clan of Rajputs. His social position is un-exceptionable , but unfortunately his means are too small to enable him to live upto his position. Almost the whole of the extensive property owned by his forefathers was confiscated after the Mutiny. I have always been of the opinion that the treatment then extended to the Rajas grandfather was somewhat harsh. His kinsman, of Samain, was unquestionably a rebel, but is seems that this man dominated the then Raja and involved him in his own fate. The Rajas father was appointed a Tahsildar, and served the Government well : a fact which is itself contradicts in some measure, the theory that the Raja was actively disloyal. I should be very glad if an opportunity arose of rectifying what I believe to have been an error of judgment. Raja Raghubir Singh is a loyal gentleman and during the present was has worked hard in the matter of recruiting for the Army. This has been no easy task for the reason that for many years the Sengars have not taken generally to military service. Through his efforts a marked change has taken place and the Sengars have done very well in the 7th and other Rajput regiments. I hope he will continue his exertions and that his work will receive suitable acknowledgement. ********* I write a few lines of farewell. I have enjoyed the pleasure of your acquaintance and I know the great influence for good which you exercise in your district. In recent years I have had particular reasons to be grateful to you for your efforts in recruiting. You have stirred up the old military spirit among the Sengar Rajputs of your brotherhood, and you have sent a very valuable contribution to the Indian Army. I trust that your honour will increase and that alll success and happiness will attend you, and I remain. Of the United Provinces of Agra and Oudh. 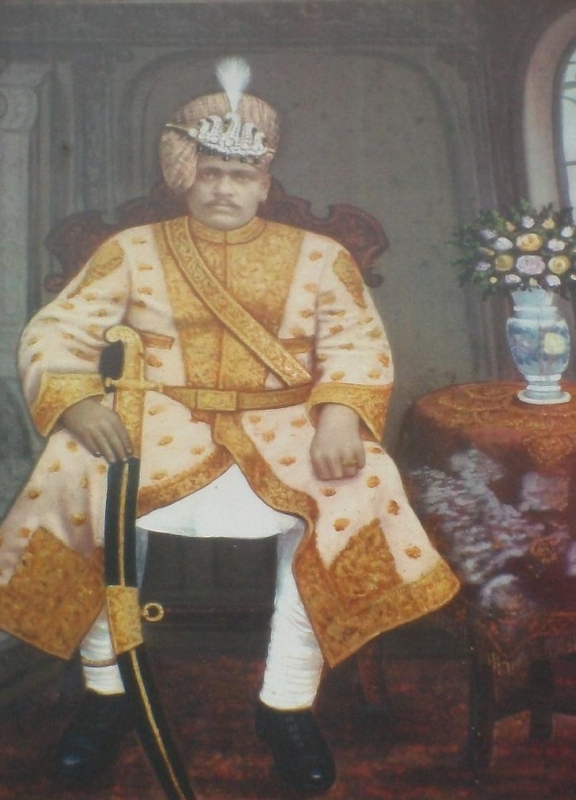 Raja Raghubir Singh of Ruru. 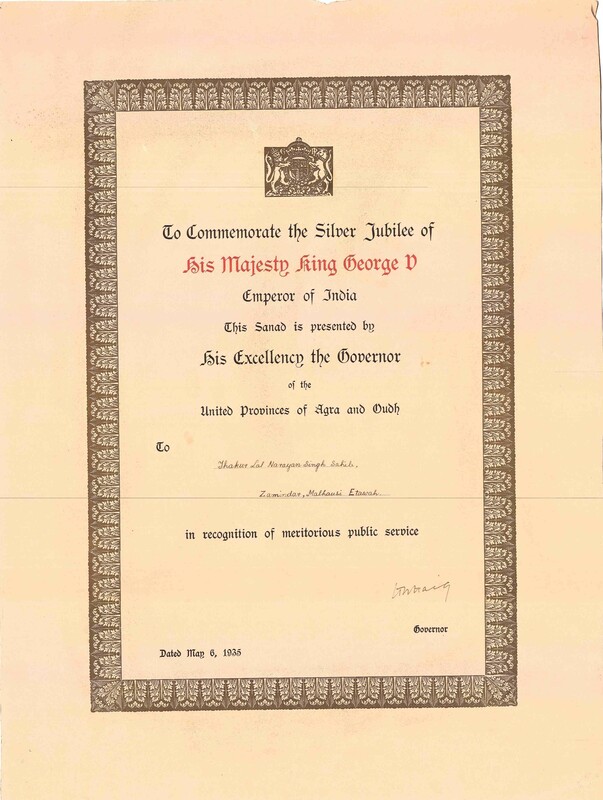 The Government of India wrote for the contribution of Raja Raghubir singh for his contribution in the great world war. 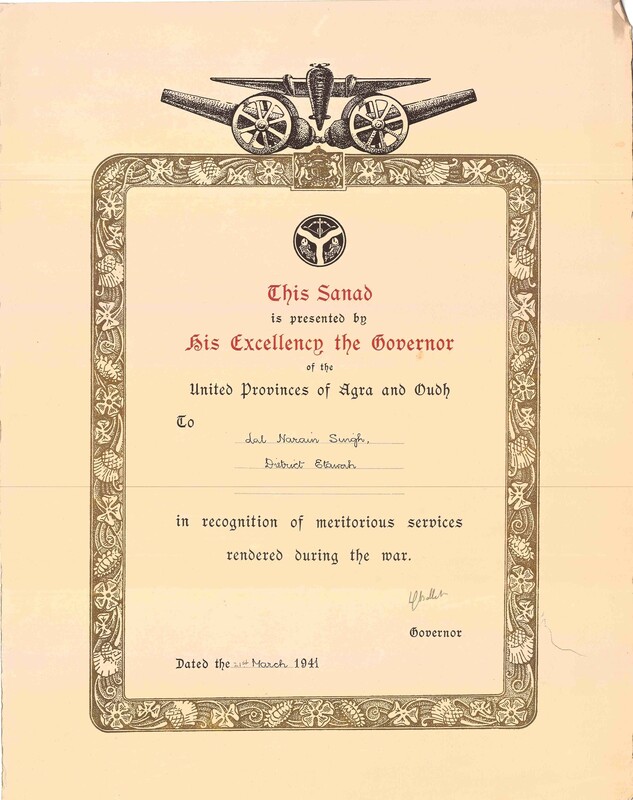 “This sanad is presented to Raja Raghubir Singh of Ruru, Etawah District, by order of His Excellency the Viceroy and Governor General of India, in recognition of services rendered to the Indian Army during the Great War and as a mark of approbation. In 1919 the Government appointed the Raja of Ruru as Honorary Magistrate and was granted a rebate of Rs 1000 on yearly land revenue for his life time. Shri Dewan Sahib were considered among the Ruling Chief. The place was called Sarwan because this place was established by a brahman known as Anand on the day of “Sravan” in 1298 AD. The town had a mixed population of brahman’s, thakurs and baniya’s along with a Gardhi (Mud fort) The Gardhi was built some were near 1305 AD by Raja Sarang Dev ju. 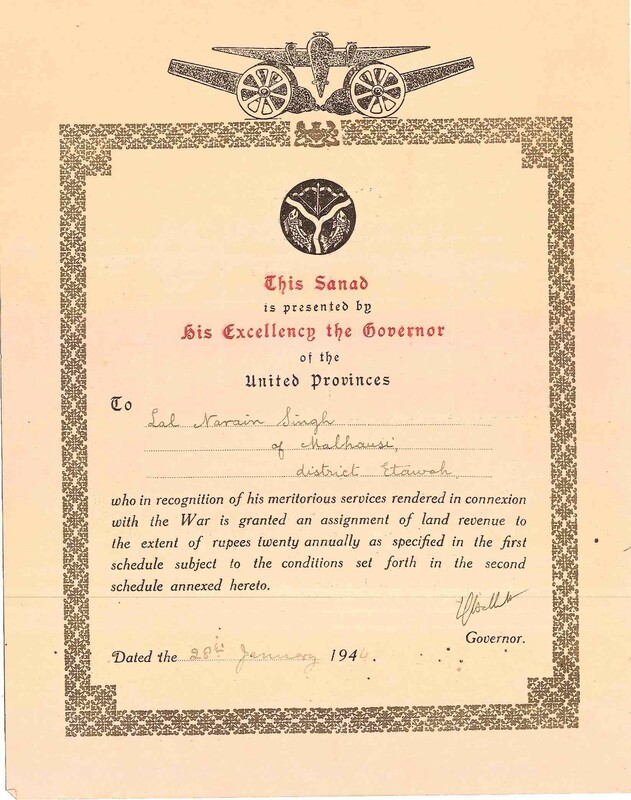 The Income of the Dewan of sarwan was Rs 15000/- and had to pay Revenue of Rs 9000 to the British Government. (“Geography District Jalaun”- Government Press, Prayag 1884 AD). During 1853 AD the kingdom had a total income of Rs 28000/- and only paid a revenue of Rs 3526/-. This reduction in the income of the ruling chief were due to the government policies which in the end lead to the downfall of this kingdom. The government also took away the title of Dewan as we do not find any mention in the Manual of Titles but were addressed as “Gardhibandh Thakur” (Thakur with an enclosed mud fort). 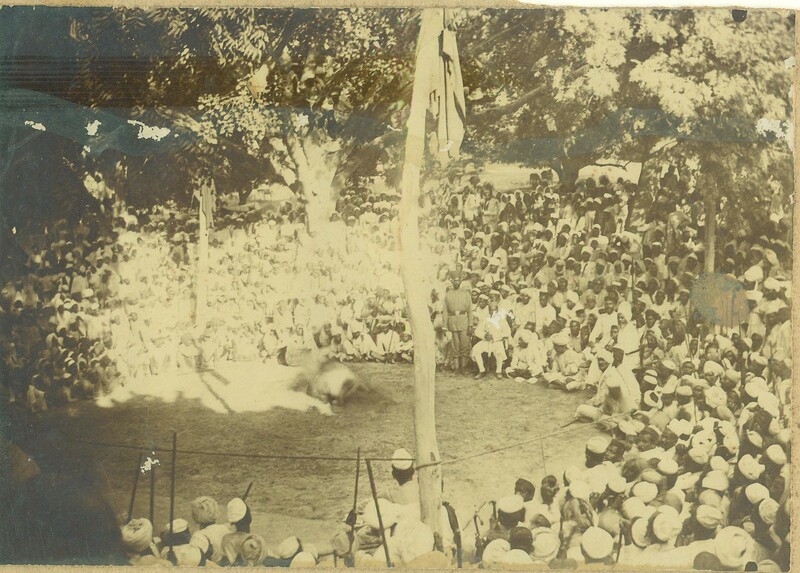 The last Dewan before independence was Shri Dewan Maharaj Singh Ju Deo.